Buying a used caravan can be tricky, so here are some tips on what to look for and what to look out for. Buying a second-hand caravan is a fine option if you’re ready to get into the caravanning lifestyle but can’t afford a new van. However, a lot can go wrong if you’re not careful – the last thing you want is to buy somebody else’s problems. To help you avoid making an expensive mistake, we’ve put together some expert advice to help you choose a first class second-hand caravan. We spoke to caravan repairer Graham Williams of B&B Caravan Service and Repairs, Brisbane, who said the visual appearance of the caravan was important but not the only consideration. 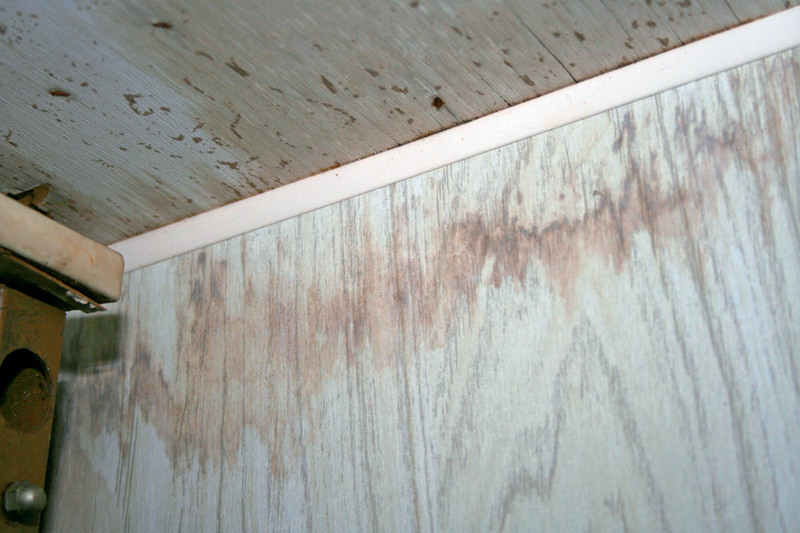 The key places in which to find the tell-tale marks of water damage are around windows, in and underneath cupboards, in corners, in overhead lockers and roofs. According to Graham, if you can see cracks in the sealant around windows and elsewhere, the van is likely to have some degree of water damage. See if any water stains are obvious on roof or wall linings; even if they’re dry you’ll want to verify if the leaks have been repaired. Also check the cupboards for ply or laminate disintegration. It is important for buyers of second-hand caravans to look for chaff marks near where the individual sheets of aluminium cladding overlap. Graham said such marks meant that “either the chassis was too weak or you have timber rot”. For people considering caravans with fibreglass walls, the repairer said to be aware that they inevitably become dulled by sun damage and might need to be polished or painted with two-pack acrylic enamel. While you’re inspecting the cladding, how many scrapes and dents are there? When looking at a van it’s easy to forget to check up on top. 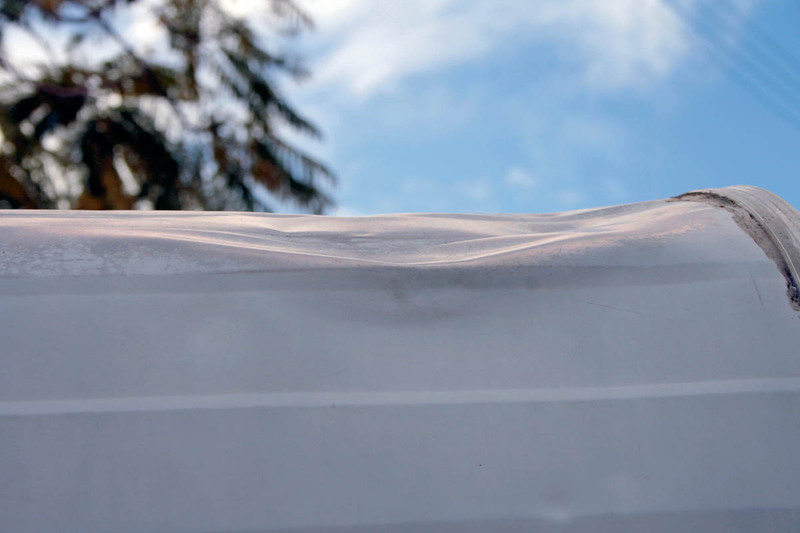 Creases on front and rear roof sections are common, and hail damage can be restricted to the roof – which can easily be missed. While looking at the roof, check for deteriorated joint sealant, which will suggest leaks are, or will be, occurring. Also look for the use of clear silastic, which is not the recommended sealant for caravan roofing but a common one for the home handyman to use in place of the more expensive sealing agents, which tend to be off-white in colour and less flexible than the rubbery, clear silastic. 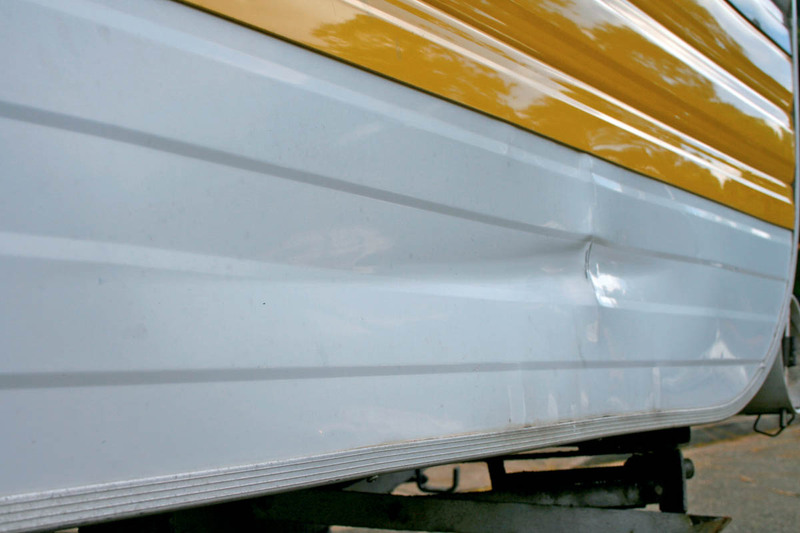 Always inspect the condition of the chassis of your prospective second-hand caravan, especially for cracks. Surface corrosion is not unusual but it suggests the caravan may have been used in a moist environment. If the van you are interested in is an offroader, make sure that the undercarriage is not badly pitted. The more pitting you find, the more likely it is that the van has been bashed along a number of rough and tumble outback tracks. While you’re under the van, check the state of the electrical, gas, brake and water lines, and the water tank. The handbrake must tension the brake lines. Don’t attempt to test the strength of the handbrake as caravan handbrakes don’t tend to be very strong – this is best left to an expert. At the front of the van, inspect the gas cylinder(s) to see if it is still in date. Gas cylinders must be inspected within 10 years of the previous check. Ensure the load rating of the coupling exceeds the van’s ATM (the total permissible laden weight of the van). This figure should be noted on the van’s compliance plate, though vans built prior to the late 1980s might not have a compliance plate fitted. Also check that the VIN number corresponds with registration papers. A tyre that’s more than six years old should be treated as perished, regardless of the amount of tread it has. 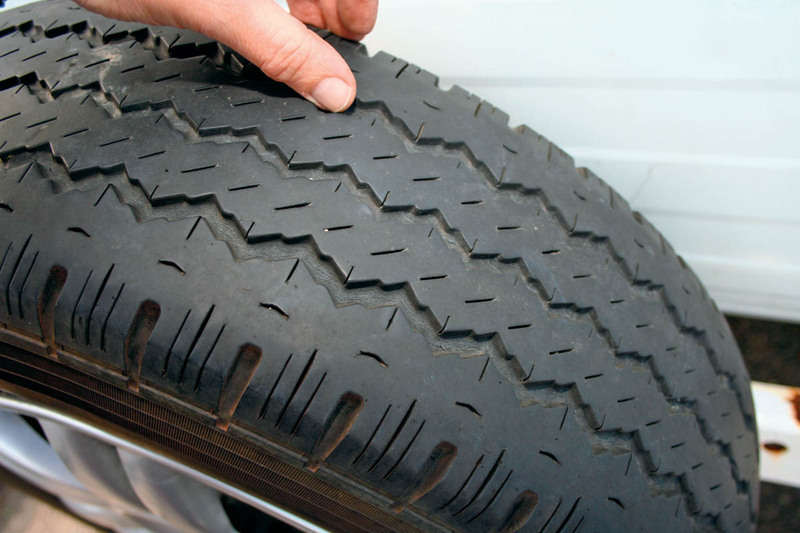 Don’t limit your wheel check to the condition of the tyres. Also check the wheel bearings – jacking wheels off the ground is preferable but not often possible. Grip the wheel and rock it forwards and back (as you face the wheel). Listen and feel for any knocking or looseness, which can suggest a damaged and/or loose wheel bearing. Barry Barker of second-hand caravan dealer and repairer Arrow Caravans advises potential buyers to seek out a licensed dealer, rather than taking a chance on a private purchase. A licensed dealer also provides a guarantee of clear title over the van “which you can’t guarantee by buying privately”. A clear title means there’s no money owing on the product in question, whether it’s a caravan, boat or car. His final piece of advice is for buyers to work with a dealer with whom they feel comfortable and can develop a trusting relationship. 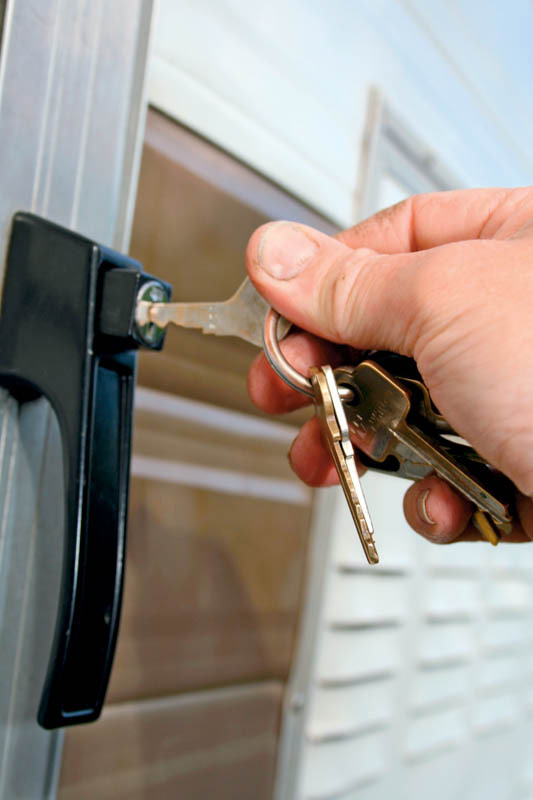 Finally, make sure that all boot, door and other locks have the appropriate keys, that all cupboard latches, window locks and window winders operate, and that all electrical and gas fittings work. 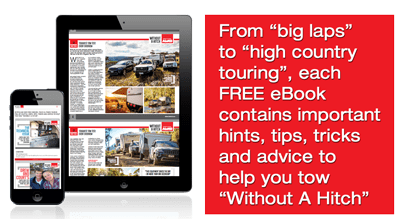 This guide is not comprehensive, but it will give you an indication of what you need to look for before getting more serious about a particular second-hand caravan. Remember: deal breakers include a damaged chassis, doubts over ownership or extremely poor condition – unless you are looking for a restoration project, walk away. You’ll find better.